Heading north again this time. Humevale Rd to start the day and then it's down the other side to Hazeldene before cutting across Mt Disappointment State Forest to Wallan. Some good climbs in this section - might even check out Strath Creek Falls if the legs are up to it. After Wallan, Old Sydney Rd will take us homeways in the best way - on rollers made of dirt. I'll be running a freewheel for this one - time to enjoy some descents! So we followed the route as planned, all of us finished it and we didn't have to walk any sections. Was that really a TWBD ride?! It was dark when I left home and the sky was full of stars - very clear, crisp morning - I saw a shooting star - good omen? Tom and HMC were waiting for me at Fed Square. Plenty Road was boring as usual but when we reached Ridge Road we got a taste of the awesome views we'd see throughout the day. The sky was crystal clear - while enjoying a quick natural break I could see out east from Ridge Road to Mt Dandenong, Mt Donna Buang, Mt St Leonards - all with the lush green hills of Arthurs Creek in the foreground. Wunderbar. 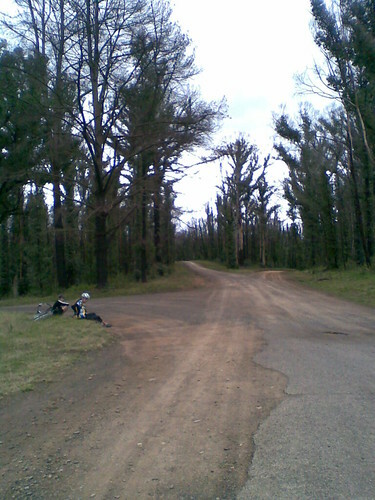 Ridge Road was awesome - it follows the perimeter of the Yan Yean reservoir - a well-made dirt road with rolling hills. Can't remember seeing a single car through there. Did see some roos though. Just a shame that Melbourne Water has fenced up so much of the land round there - bastardos! Humevale Road climb was good fun - we chatted and spun all the way up - Tom was beginning to have a good day and was really stoked on his choice of 2:1 gear ratio. Coincidentally, I was running 2:1 as well and I gotta say it worked a treat. Low enough to climb well but not granny gear low. And freewheel for the downhills of course. I think it's a winning setup - you could cover a lot of varied terrain with that gearing. I made sure to buy a few things at the store at Kinglake West - it's still operating out of a little portable shack thing since the original got burned in the fires. So, flat fixed, we headed down, down to Hazeldene. Nice descent but there was a stiff northerly blowing in our faces which slowed us down a bit. We overshot our turnoff and had to backtrack a bit - turns out it's called Flowerdale Road on all the maps but it's called Forest Road in real life. Thanks internet machine! Anyways, it wasn't much of a diversion and pretty soon we were back on track and climbing up from the valley at about 12%. It was a well-made dirt road, beautiful green regrowth everywhere - something seemed to happen inside Tom around here and he just took off up the hill like an animal. I sat in at my own pace - getting out the saddle every now and then to stay loose. HMC was running gears so he cranked it right down and found a comfortable rhythm. We wound up and up and eventually got to the top - awesome view of the valley below - we could see way down to the main road we'd just turned off. Fantastic. And then we had about 40km of beautiful riding. Nice wide smooth dirt road through rolling hills with tall trees on all sides, all burned and covered in lush green regrowth. It was magic. The uphills were never long enough to cause too much pain and the downhills were as fast and safe as you could want for a dirt road. We each found our own pace and cranked along just enjoying the solitude and tranquility of the bush. Just an awesome place to ride. Tom was having a blinder and was way off the front for most of this section - I've never seen him ride so strong. HMC and I kept it ticking over and we regrouped every now and then at the top of climbs or at questionable intersections. At one point we came across a junction of five trails with only half of them signed. We all had a guess at which was the right way and we were all wrong! Lucky there was mobile reception and Mister Google saved us from a costly mistake. The further west we travelled, the more activity we came across. First it was the occasional 4WD, then dirt bikers and the odd gunshot. Everyone I came across was nice and polite - returned my wave, slowed down when passing, one 4WD even stopped and waited around the corner when they saw me screaming down to the hairpin they were about to enter. Everyone must have been too stoked on the awesome bush to bother with being aggro. And then we got our reward - an awesome uninterrupted view of the city. It was an unbelievably clear day - we could see boats in the bay, we could even clearly see the line of Red Hill/Arthurs Seat way down on the Mornington Peninsula. Tracking west from the city we saw the You Yangs and further west, Mt Macedon, clear as crystal. I took some photos but, yeah, you really had to be there. Ironically, Mt Disappointment was so named by Hume and Hovell when they climbed it and looked back down hoping to see Westernport Bay and were disappointed with the crappy view they got. We sure as hell weren't disappointed, that's all I know. We soaked up the view for a while and then hit the descent down to Wallan. The last part of Lords Road is stupidly steep and the road is rutted and gnarly as hell. I didn't enjoy it at all and really need to make my brakes work better - fortunately any road that steep can't be too long - we were only coming down from ~600m or so after all. So we came off the mountain, got chased by a happy dog, bossed around by girls on horses and then we hit the main roads over to Wallan for a much needed feed. At this point it looked like we might run out daylight so we finished our food and got onto Old Sydney Road with that stiff northerly at our backs. I love that road. On the left you've got wide green plains and the Hume Fwy far in the distance - on the right you've got Mt Macedon on the horizon, with the sun setting behind it. It always feels special to me up on that road - looking down at the freeway and all the cars moving along silently into the city. It's so quiet up there and you feel so removed from the noise and pularver of civilization but you know the road takes you directly back into the machine and that, soon enough, you'll be bouncing along on the busted shoulder with angry busses flying by your elbows. Ah, I've just placed it - it's the same feeling you get when it's the last day of a two week snow trip and you're sitting up somewhere high on the mountain just trying to soak it all up and thinking, "Faaark that was awesome." And then you crank your bindings one last time and push off into the fading light for the very last run of the season. And then some bogan in a ute flies by at 120km/h and you realise you're not that far away from it after all. Oh well. Tom had previously made some grumblings about catching the train at Craigieburn but, despite the rolling terrain, he came to his senses and we all stuck it out all the way to Fed Square. And, somehow, we all felt like we could have just kept going - in fact we all rode home so it was over 200km for the three of us that day.